Three-door hatchbacks are very rare in Singapore and Ms Cai Simin is a pleased owner of one - a 2004 Suzuki Ignis Sport. The 34-year-old, who declined to reveal her occupation, bought the second-hand car in 2012 with the intention of using it until the end of its certificate of entitlement (COE). However, after driving the Ignis Sport for two years and with its COE nearing expiry, she could not bear the thought of having it scrapped. "I had become very familiar with the Ignis and enjoyed driving it every day. The car was still running very well and no part of it seemed like it was going to fail, so in 2014, my husband and I decided to renew (the COE) for another 10 years." She had picked the Ignis Sport because it fit her requirements. "I wanted an inexpensive small car and, as stipulated by my husband, it had to have a manual transmission. He wanted very much for me to maintain my familiarity with a clutch pedal and manual gear lever." For those not familiar with this Japanese car, the Sport version of the Ignis is well liked by many car enthusiasts because it is simple, no-frills and fun to drive. The Ignis Sport comes with a five-speed manual gearbox, a three-door hatchback body and a 1.5-litre, naturally aspirated four-cylinder that has been tuned for 107bhp. The car is a hoot to drive because of its light weight (just under 950kg), compact size, responsive chassis and smooth, free-revving engine. There are very few Ignis Sports left in Singapore. Most of them were scrapped when they reached their 10th year. Ms Cai's Ignis Sport has, thankfully, been rescued from the crusher. Her engineer husband Ng Kiang Loong, 36, is a hands-on motorist who knows cars well, so the Ignis has received the care it needs to stay mechanically healthy. One of the first things he did was to upgrade the brakes and suspension. "Kiang Loong has borrowed the car on several occasions to participate in gymkhanas and track days in Singapore and Malaysia," says Ms Cai, who has also had a go at the same driving events in the car. "During those events, I learnt a lot more about how my car behaves at speed and appreciated it even more after that." Despite its relatively tough life, the Ignis Sport has never faltered. The odometer has just crossed the 170,000km mark and, just a couple of weeks ago, the hatchback received a cosmetic makeover - a full-body respray. "Its boxy shape may not be to everyone's taste and there are no fancy gadgets or high-tech features but, for me, it has an uncompromised interior with comfortable seating for the driver. 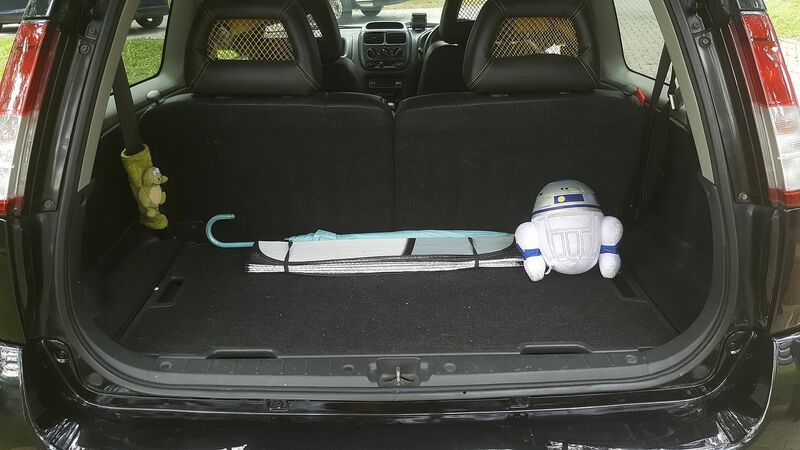 And when the rear seats are folded down, it can carry a surprising amount of cargo," she says. "It is also extremely nimble and hence easy to drive in the city, zipping in and out of traffic. I especially like the fact that it slots comfortably into any parking space. And the manual gearbox is part of the fun." The Ignis is actually quicker off the mark than the family's other car, a Mitsubishi Lancer Evolution IX Wagon, which is usually driven by Ms Cai's husband. Recently, the car has had to revert to the original suspension just to improve the ride comfort, as she is expecting twin boys who are due early next year. But, she says, the children will travel in her Ignis Sport strapped into their baby car seats, of course.